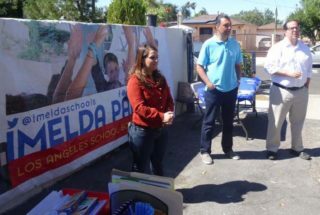 More people turned in ballots for the two LA Unified school board seats in the May 16 runoff than for either of the city council elections that day or Amendment C, the citywide ballot issue on police discipline. In the final tally, released Friday by the LA City Clerk’s Office, 11.35 percent of the voters showed up for LA Unified elections, while 10.71 percent voted in the city elections. Either way, it was a poor showing. And, for the school board, the amount spent per vote in the LA Unified elections — in both the March primary and the runoff — came to $61 per vote, which could have bought each LA Unified student two new textbooks. On Tuesday morning, Imelda Padilla conceded to Kelly Gonez in a personal email and a Facebook post for the District 6 race after the final tally showed she lost by fewer than 1,000 votes. Padilla, who lost 48.5 percent to Gonez’s 51.5 percent, said she felt bullied during the campaign that spent $2 million in just the last week against her. The spread between school board president Steve Zimmer and challenger Nick Melvoin in the District 4 race narrowed only slightly from the commanding 60-40 lead Melvoin had over Zimmer when absentee votes were counted, which caused Zimmer to concede before any results from polling places had been reported. In the final tally, Melvoin had 57 percent to 43 percent for Zimmer. Zimmer refused to call Melvoin on election night but did send him an email the next day. “He sent me a very nice note, and I hope to learn from him as we gear up for exciting new prospects for the school district,” Melvoin told LA School Report. Charter supporters spent about $9.7 million in the race. The wins by Melvoin and Gonez created the first pro-reform majority on the school board since 2010. Historically, school board elections have had low voter turnout hovering around 10 percent. In the March primary, only about 8 percent of eligible voters actually voted. Total spending in both the primary and runoff — $16,879,410 — divided by all votes cast comes out to $60.87 per vote. In the primary election in District 4, outside groups and candidates spent $50.63 for every vote cast. In the runoff, outside groups and candidates spent $75.35 for every vote cast in the District 4 race. In the primary, outside groups and candidates spent $37.51 for every vote cast in District 6. In the runoff, outside groups and candidates spent $142.59 for every vote cast in the District 6 race. $4,888,606.26 was spent on the District 4 primary race, with 96,558 votes cast. $1,613,445.31 spent on the District 6 primary race, with 43,018 votes cast. $5,091,293.03 was spent on the District 4 runoff, with 67,570 votes cast. $4,699,337.76 was spent on the District 6 runoff, with 32,957 votes cast. Reporter Sarah Favot contributed to this article. * This article has been updated to add that Imelda Padilla initially conceded in an email.